Little Baby Jesus of Flandr is one helluva wacko arthouse flick, even for wacko arthouse flicks. Youâ€™ll find out why in a minute. Itâ€™s also a vague retelling of the story of the Three Magi, and appears to either celebrate a romantic, naturalistic version of Christianity, or is a not-so-subtle dig at how the power of religious ceremonies can influence the mind. That either/or choice seems to be at the heart of this oddly fascinating flick. Writer/director Gus Van den Berghe concocted Little Baby Jesus (LBJ) as an extension of his film school graduation project. Seeing as it wowed them at Cannes, Iâ€™m guessing he passed. The original story is a 1924 play by Felix Timmermans, a Flanders writer obsessed with religious themes, and Van den Bergheâ€™s rewriting concerns the spiritual adventures of three poor rural peasants over a three-year period as each experiences a religious epiphany roughly based on their individual characters. Sounds sort of boring, but Van den Berghe has yet to add his artsy vision, starting with some extraordinary cinematography, shot in a sort of ripped, grainy black and white that emphasizes the Bruegel-like quality of the winter landscape, some amazingly inventive setpiece scenes, some of which work better than others, a few costume homages to Fellini, and best (or worst) of all â€“ most of the major characters are played by actors with Down syndrome. Yes, theyâ€™re obviously mentally and physically handicapped. Is this a stroke of subtle ironic genius? Or is it the ambitious audacity of a first time filmmaker who wants to start his career with a controversially bold statement? Hence the either/or quandary that plagues an easy interpretation of this film. Our three â€œwise menâ€ are peasants and beggars named Schrobberbeeck (Peter Janssens), a realist who steals chickens, Pitje Vogel (Paul Mertens), a moral weakling who wears an oversized bowler hat and loves gin, and Suskewiet (Jelle Palmaerts), a shepherd who is the first to succumb to a spiritual epiphany. Van den Berghe divides his tale into three Christmases, and each year marks a further deepening of their odd spiritual existence, with all three buying into the idea theyâ€™re the three wise men in the first year, with only Suskewiet convinced the baby is God. Over the second Christmas Suskewiet becomes baby Jesus while Pitje Vogel and Schrobberbeeck argue over Suskewietâ€™s change, and they split up only to have Pitje Vogel striking a deal with the devil. Over the third Christmas Pitje Vogel appears to have died but when Schrobberbeeck finds Pitjeâ€™s been saved he also finally enters the drama of the nativity play. The plot is sort of interesting, but hardly the reason to see LBJ. There are some fantastic visual moments â€“ the three amigos on swings between two amazing trees, a beach full of small boats, each bouncing on the waves and precariously holding a life-size statue of Christ on the cross, and most odd of all, a full color sequence in which Pitje Vogel and Schrobberbeeck, dressed as carolers, mysteriously find themselves wandering through a modern nightclub featuring a transvestite singer. Huh? Sure, funky, but sooner or later you have to come to terms with the actors. Itâ€™s like watching the Special Olympics. They have trouble walking. They speak each word as if it were a sentence. They can show only the basest of emotions â€“ joy, sadness, anger â€“ and have unusual gestures and erratic movements. The physical aspects of their condition â€“ large foreheads and puffy, almond eyes â€“ give them a decided childlike quality, but most unnerving is their cognitively dead eyes. In order to accommodate their numerous deficiencies Van den Berghe has had to pare the action and dialogue down to the barest of essentials. Thereâ€™s nothing wrong with that â€“ thereâ€™s not much â€œactionâ€ anyway -- and the dialogue is basically poignant, satirical or personal, anyway, as our trio of sincere characters shuffle through the storyline. And therein is this movieâ€™s inherent problem: is it a straight story with mental incompetents posing as normal actors? Or is it a symbolic story in which mental incompetence is integral to the message? If itâ€™s the former, then this is an arty and humorous riff on the nativity story made slightly more interesting with unusual actors and a storyline driven equally by the visuals as it is by the sparse (and often unwittingly ironic) dialogue. In the end, â€œpureâ€ religion wins and we have a wonderfully satiric condemnation of organized religion, revealing the self-serving inanity of Catholicism (the scenes with the priest and his helper are hilarious) and yet celebrating the joy of innocence and new beginnings. However, if itâ€™s the former, then the transcendental joy of spirituality is little more than Sigmund Freudâ€™s â€œillusionâ€ â€“ an error of the simple mind unencumbered by thought but enthralled with the emotion of being loved and cared for by The Father (who art in heaven). Van den Berghe reveals how such spirituality can work in the material world: Suskewiet has the â€œvisionâ€, and its effect is anti-social â€“ he abandons his friends to live in his religious world â€“ and yet oddly intellectual, as his philosophic conversations with the priest suggests he prefers to be a protestant over a catholic. While these exchanges constitute most of the filmâ€™s humor, they also donâ€™t quite ring true and reveal a bit of Van den Berghe perhaps inserting some editorializing into the storyline. Suskewiet can barely speak â€“ it seems a bit much that he can so easily put a priest in his place. OK, maybe not. Yeah, for a short 74-minute film Van den Berghe has packed in a lot of concepts to consider, and perhaps a few too many non-sequitur scenes, especially near the end, to clearly make whatever point LBJ is all about. On the other hand, it is a student project, and it has that slightly-working-too-hard feel of overflowing ideas. Hereâ€™s an example: in the final scenes the soundtrack unexpectedly drops in â€œSanctusâ€ from the Missa Luba, a famous version of the Latin mass based on traditional Congolese songs and sung by a choir of African children. The song â€œSanctusâ€ was first featured in the 1968 classic protest film, Ifâ€¦, but Van den Berghe probably included it because the Missa Luba was also originally arranged by a monk from Belgium working in the Congo in 1958. Now, thatâ€™s depth. 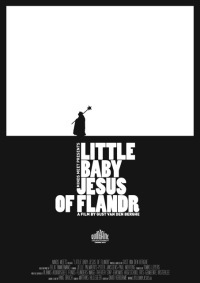 Iâ€™ll end with this: Little Baby Jesus of Flandr is one of the more difficult films Iâ€™ve attempted to unravel. Itâ€™s a very odd film to watch, as your predisposition is to keep seeing the actors as mentally unaffected people who are acting very oddly, a perceptual error that gives them childlike qualities, although theyâ€™re far from children. Is that the point? Their main effect is almost postmodern: their presence insists you recognize them as disabled actors playing non-disabled people, and this flipflop effect is one of often being brought out of the trance of the story, which is thin on plot but long on facial close-ups. Question is: would they act this way â€“ and would the story be the same â€“ if these roles were played by normal people? I think not, as we would inexorably tend to relate to the characters in a way we canâ€™t with people from a foreign intellectual space. Itâ€™s an interesting problem, and one Iâ€™m sure Van den Berghe saw as the creative crux of the movie. Otherwise, the cinematography is simply wonderful in places, dirge-like in others, some of the images are inspired, and numerologists will have lots of fun with Van den Bergheâ€™s obsessive use of threes throughout the film. Watch for the Santa reference, too -- that was another of Timmermansâ€™ obsessions. My ranking of 7? Thatâ€™s an average of 9/10 for sheer creative wackiness and 5/10 because of the worrisome ambiguity of the religious message, and lord knows we really, really donâ€™t need any more promotion of the old â€œbelieve as I do or Iâ€™ll kill youâ€ ideologies. Iâ€™d recommend it as an unusual experience, though, and am looking forward to Van den Bergheâ€™s next effort. I loved it and have one of the rare copies, hopefully it will see some type of release. Yeah, I tried contacting the director for a screener, but no luck. Fingers crossed for a dvd release or an IFC online release or something. you must understand that we cannot send out screener copies when the film still is doing his 'festival parade'. We still hope that some distributor has the audacity to release this film in the US. And if not we will release a DVD via the website next year.